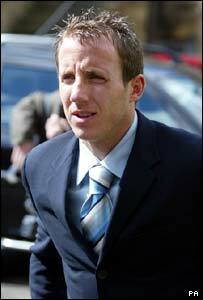 Footballer Lee Bowyer has been banned from driving for 42 days after pleading guilty to speeding at 99mph. The 29-year-old Newcastle midfielder changed his plea on the eve of his trial at South East Northumberland Magistrates' Court, in Hexham. He was also fined £650 and ordered to pay £100 costs. He was accused of breaking the speed limit in his Porsche 911 on the A1 near Morpeth, in Northumberland, in July last year. He had been accused of driving at an average of 112mph on a stretch of the 70mph road with his speed peaking at 132mph. Bowyer was represented in court by Manchester-based lawyer Nick Freeman, who has represented a number of other celebrities accused of motoring offences. Mr Freeman told the court his client should be given credit for his plea because it was the first time the offence of driving at 99mph had been put to him. He outlined previous speeding convictions that his client had received, including a 42-day ban for driving at 67mph in a 30mph zone. Chair of the bench Margaret Kynoch-Macdonald said: "Because this is the second time you have been excessively speeding in the past three years, we ban you from driving for 42 days." Accompanying his client as he left court, Mr Freeman said that following discussions with the prosecution, his client had admitted speeding at 99mph rather than the original charge at more than 100mph. He said: "He was summoned for speeding, he was not summoned for speeding at 132mph. "There was a great deal of negotiation with the Crown and my client pleaded guilty to speeding at 99mph. "It was a plea the Crown accepted."